All the colours of the rainbow feature in this plant-based falafel and hummus wrap. For extra flavour, drizzle over a spoonful of Indigo Herbs’ Sunflower Seed Butter. How do you make a bog standard, lunch time wrap a little bit more interesting? You make it colourful of course. I’m a big believer in “eating the rainbow”. If your meals are full of colour then not only are they more appetising, but they’re also more likely to be full of nutrients. For vegetarians and vegans everywhere falafel and hummus are pretty much staples so it was no surprise that when I started Veganuary I stocked the fridge full of the stuff. But hummus and falafel in a wrap is pretty…beige. Unless you stuff it full of colour. Bright pink beetroot falafel from Gosh! are at the centre of this wrap. Next comes sweet orange carrot, earthy green spinach and then finally hummus. If you can’t find beetroot falafel its not a problem. You can use whatever falafel you find at the store. Or, if you’ve got some time on your hands, why not make my sesame crusted falafel? You can also pick any store bought hummus but this beetroot hummus would also work really well. To top it all off a drizzle of Indigo Herb Sunflower Seed Butter adds a really deep flavour and extra creaminess to the wrap. I do feel a little cheeky calling this a “recipe”. Because, if I’m really honest it’s just an assembly job. As was the Ultimate Vegan Club Sandwich I posted right at the start of Veganuary. In my defence, anyone who is starting out on a plant based diet needs quick and easy lunch time inspiration and both of these recipes are quick, easy and perfect for a packed lunch. 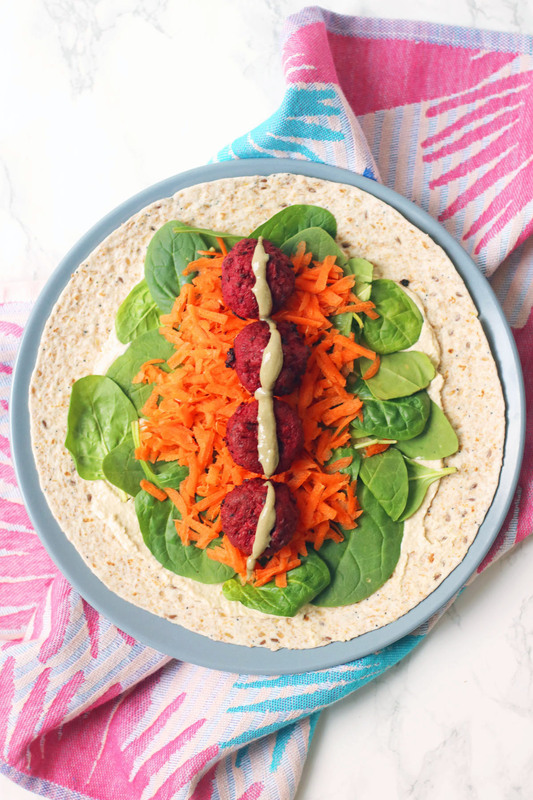 All the colours of the rainbow feature in this plant-based falafel and hummus wrap. For extra flavour, drizzle over a spoonful of Indigo Herbs' Sunflower Seed Butter. Spread the hummus on the wrap and layer with the spinach and grated carrot. Line up the falafel down the centre of the wrap and drizzle over the sunflower butter. Fold the top of the wrap and bottom of the wrap into the centre followed by one long edge. Keep rolling until the wrap is enclosed.